Rui Da Silva saw his music leap from club to the big time when his song Touch Me became an international number one single. Rui is actively involved in planning the future of music and shares his thoughts with Andy Leavy. Hi Rui, so how would you explain the blockchain to someone who knows nothing about it? Rui Da Silva: OK so blockchain is the underlying technology that powers Bitcoin… the same way the internet powers email. Currently many people confuse both blockchain and Bitcoin, in the same way back in the early 90’s people confused email and internet. It’s natural as people slowly discover this technology. More specifically, the blockchain is an incorruptible digital ledger of economic transactions. This ledger can be programmed to record not just financial transactions but virtually everything of value. Blockchain technology is like the internet in that it has a built-in robustness. By storing blocks of information that are identical across its network, the blockchain cannot be controlled by any single entity and has no single point of failure. What impact could it have on the music industry? Rui Da Silva: Put it this way… this was the picture that explains how it will impact our industry taken at ADE panel. I could not say it better but will try. It is going to disrupt and shake the industry to the same magnitude that the internet has done before with the way we communicate. What the music industry will be after the impact is a totally new and unrecognisable music industry, it is that disruptive. I believe any music industry company that currently has a business model that benefits from either slowing down payments to creators, or have business models that benefits from obfuscating these payments most likely will be exterminated. Another area that will see substantial reduction in the amount of business is litigation. With “smart contracts” they will become nearly unexistent. You can imagine a world where all layers of management inside a company is run by computer code, contracts with suppliers and costumers are written as computer code, extinguishing all jobs from CEO’s to middle management inside a company, that’s if companies even have an existence in this new world. Most likely they will not. There will be creation of new jobs in other areas, but at present is very difficult to understand what areas are going to be. It is difficult to know the areas where jobs will be created, mostly due to AI coming into play in this new world and making many decisions based on big data. We are several years away and there is a tremendous need for highly specialised individuals that can program and break through the challenges this technology has. If you compare it with the evolution of the internet, we are at the stage where people started to discover email and the fever of the early dotcom bubble. 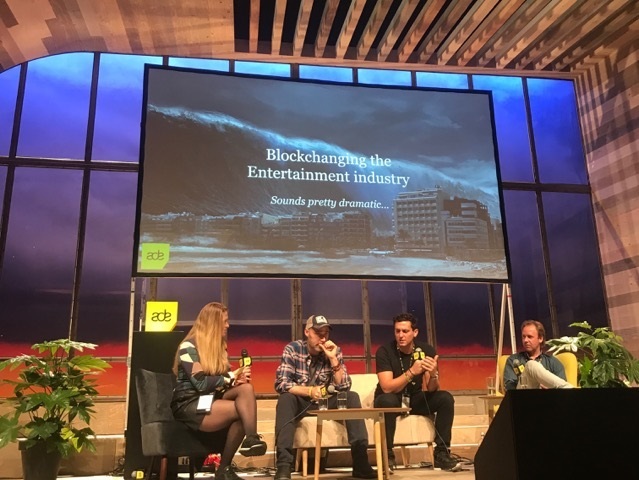 Like it was said at the panel at ADE, any company that wants to stand a chance of surviving the gigantic tsunami, needs to have an department researching blockchain right now. Currently the foundations are being built fiercely for this new world. At present there is a total of $170 billion dollars invested into this space in about 1300 companies. Everyone is racing to get the big break through. Once that happens, adoption will be quicker than we witnessed with the internet. When do you think the moment will be to get fully involved? Rui Da Silva: I think everyone should be getting involved now. It is not a question of if you will get involved or not… the question is when will you get involved? Like the internet it will be nearly unavoidable. What time saving benefits could it have for people managing artists and labels? Most benefits will come from speed of payments, proof of ownership, smart contracts, plus also, more money can potentially transfer from consumer to creator with very little staying in the hands of middle man. Currently it is very difficult to prove ownership of a song and even harder to get paid, taking usually a very long time for the payment to be processed, as it stops in a myriad of middle man, that is only intent on taking a cut, before passing it to the next middle man. What’s the downside risk to all this? Rui Da Silva: The downside is that humans will devise another way to distort and create an unfair system to service their own selfish souls, to the detriment of everyone around them and bring about the destruction of the ecosystem where they live. Hopefully many of us have now wise up and understand how important is to keep the ecosystem where you exist healthy before you put you own selfish will forward. But saying that… the world we live in is still a world of stupid people swimming in a sea of idiots surrounded by bad individuals. What crypto/blockchain projects are you currently involved in? Rui Da Silva: Due to several NDA’s I can’t say much more than I’m in a couple of advisory boards for upcoming interesting startup projects. Most of these projects are related to the music industry. More publicly I’m actively releasing my music on the blockchain (click here) and I’m part of the network of miners that keeps the blockchain security of www.musicoin.org up and running. In a more general way I’ve been helping many individuals start their adventure in the crypto/blockchain by the way of some private consultations. But many of these individuals are not necessary related to the music industry, they just want to get their head round the whole blockchain/bitcoin thing and setup themselves with some bitcoin and wallets. What things really piss you off about the music industry right now? One thing that is probably the most damaging is the way independents are treated in platforms like Spotify. Due to the way business deals are being done between Spotify and the major labels, these deals are having a very bad impact on the independents. Currently for Spotify to be able to have the majors catalogue on their platform, they must pay an advance of usage. Yet no such thing exists available for the independents. In principle one does not necessarily see any problem, since they have vast valuable desired catalogues right? The problem is that Spotify pays huge amounts of money for these catalogues as an advance that expires in a few years. Like a due date. If they do not deliver enough streams to cover all the advance, they basically have to pay again someone else for those streams they generate. Now this looks great from the surface for major labels, but creates a nefarious effect on the other side. So Spotify are forced to push mostly content that they already paid streams for or more exactly the major labels on their playlists. And who suffers from this? The independents that are unable to demand any advance and also don’t have the same chances. And let’s not forget the majors already have a share on the Spotify company itself. Let me explain it with an analogy too; imagine you have a shop selling milk. This milk has a due date. Once that due date is gone you basically have to put it in the bin and order the same milk to replace it. One you must pay in advance and if you don’t sell it, basically you lost the money you invested. The other supplier you only pay for what you sell, and you return what hasn’t sold even if it is expired. Which supplier are you going to buy from and try and push to your customers? So this the problem the whole independent music industry is facing and that’s why it should actually be deemed illegal and unfair competition practise. On the plus side algorithm based playlists are levelling the field in ways we do not yet understand. Music wise and touring – what’s coming up?